Russian Sukhoi Su-24 jet makes a low altitude pass by the USS Donald Cook in the Baltic Sea, April 12. Former Russian pilots speak about why the “buzzing” of the American destroyer U.S.S. Donald Cook by Russian fighter jets in the Baltic Sea on April 12 was not dangerous and explain the main difficulties in maneuvering over sea. Russian pilots have denied that an incident in the Baltic Sea on April 12 in which Russian warplanes “buzzed” the American destroyer U.S.S.Donald Cook was dangerous or unprofessional. U.S. military sources said that the Russian planes flew over the U.S.S. Donald Cook in neutral waters at an altitude of less than 30 meters, about 10 meters from the ship, which they described as "unprofessional and unsafe." 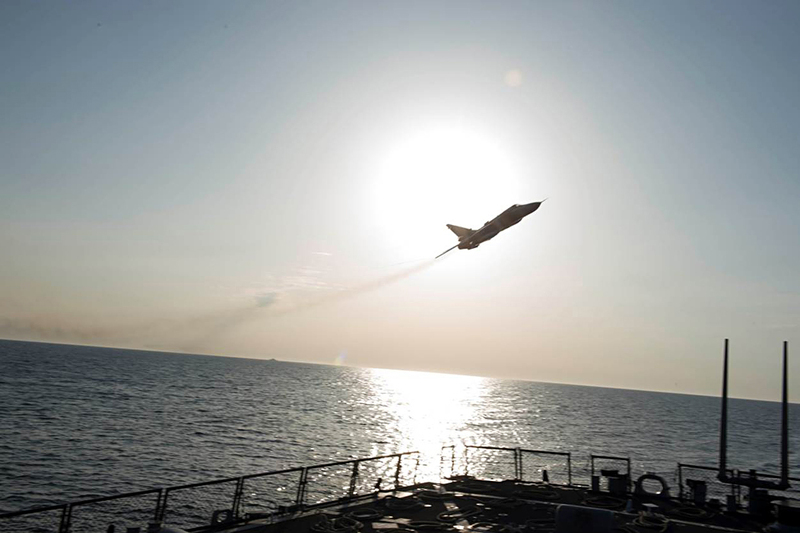 According to the American mass media, two Su-24 planes, supposedly unarmed, flew close to the destroyer U.S.S.Donald Cook, which was conducting routine drills with a Polish air force helicopter. On two consecutive days the Russian bombers flew around the American ship and prevented the Polish helicopter from taking off. A Russian Ka-27 helicopter was also picked up in the area. "On Tuesday, April 12 two Russian combat Su-24s, supposedly without ammunition, flew around the Cook 11 times. At one moment the Russian plane flew 30 feet (9.14 meters) from the ship," stated Pentagon representative Michelle Baldans. When a video of the incident was posted on the internet, Gazeta.ru asked Russian pilots to comment on the incident in the Baltic and explain how dangerous it was in their view. "Everything was piloted normally, everyone flew correctly, there are no issues. If he flew so low it means that the pilot is professionally prepared. Since they were flying, it means that it is permitted to fly in that way,” said Major General Alexander Kharchevsky, former director of the Lipetsky Aviation Center and a distinguished Russian military pilot. “We must show our level and our might, they [the Americans] recognize only force. These are just flights at extremely low altitudes, but they are part of the preparation," he said. According to Colonel Anatoly Kvochur, a Hero of Russia and distinguished Soviet test pilot, all pilots must know how to execute a flyby at an extremely low altitude. The maneuver is a mandatory part of the military preparation course for fighter-bombers, as well as for tactical bombers such as the Su-24. "It is used for a concealed approach to the target. It is particularly important when the terrain is rough, and you can see this from afar when you're flying over the sea," said Kovchur. "In general, a flight over the sea at an extremely low altitude is rather serious, since it is difficult to determine the altitude. When you're flying over the ground you see certain unevenness, the eye has a something to cling to. But if you're flying over the sea, there is just the sea. This is serious and requires professionalism," said Kvochur. "They could have flown close enough to make a wave rise, to throw up some water and wash the Americans' eyes," he said. But retired U.S. Navy officer Rick Hoffman told The Navy Times that the American destroyer would not have opened fire on the planes since they did not carry ammunition and did not pose a threat. "We are not at war with Russia," said Hoffman, adding that you cannot kill people just because they are a nuisance. Yet Igor Konashenkov, the official representative of the Russian Defense Ministry, denied that the Russian jets had come too close to the U.S. vessel, saying that all Russian air force flights are carried out in strict accordance with international regulations on the use of air space over neutral waters. "The course of the Russian planes' flight took them through the area where the American Navy’s U.S.S. Donald Cook destroyer happened to be, about 70 kilometers from a Russian navy base [Kaliningrad – RBTH]. Discovering the ship in their field of vision, the Russian pilots turned away from it, following all safety measures," said Konashenkov on April 14.